Is the Toxicity of your Kids Beds a Concern? If you’re shopping for kids beds, price and comfort may be your top priorities. But have you thought about the toxicity of a typical mattress? Kids spend a lot of time in their beds, and during that time they are exposed to the chemical off-gassing that most mattresses produce. Kids can spend between 7 – 12 hours every day on a mattress. During this time, they breathe in chemical off gassing and absorb toxins through their skin. It’s an up-close, long-term exposure. Children’s respiratory, neurological, reproductive, and immune systems are in the early stages of development. This makes them more vulnerable to toxic chemicals. Of particular concern is brain development. Low level chemical exposure during the critical period of brain development can cause more harm than high doses later in life. 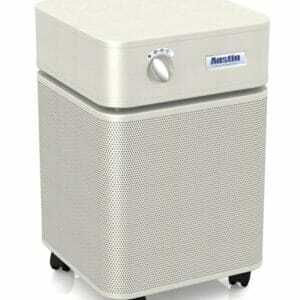 When exposed, they cannot easily detoxify and excrete these toxins, since their elimination systems are still developing. While sleeping, children’s bodies need to recover from the stress of the day. 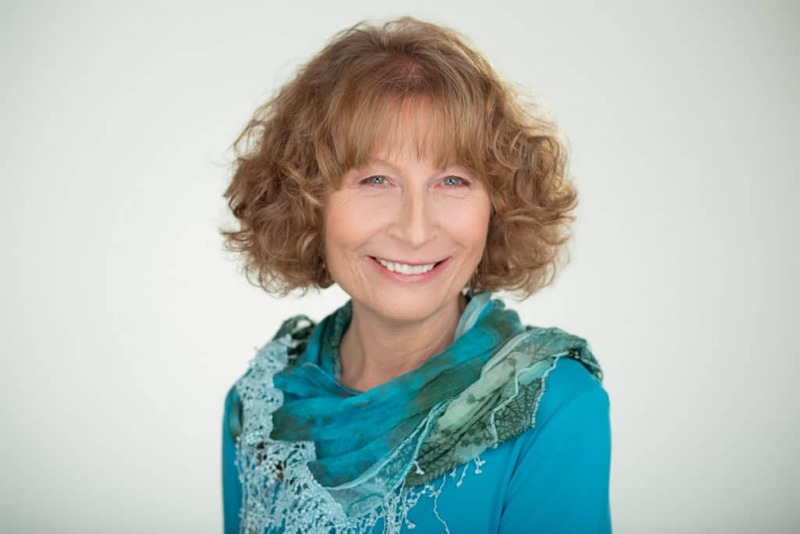 The cells regenerate and the immune system attempts to remove toxins. It’s difficult to do this while breathing and absorbing more toxic chemicals from the mattress. What’s in a Typical Kids Mattress? Polyurethane foam is the most common mattress filling, and this is made from petroleum with various chemical additives and flame retardants. Toluene diisocyanate and methylene diphenyl diisocynate are isocyanates used as primary building blocks of foam and mixed with water and polyols. Toluene is a known carcinogen and exposure to isocyanates can irritate mucous membranes and cause asthma, respiratory disease, skin inflammation, and chemical sensitivity. Foam breaks down over time into small particles, which can become airborne. Multiple VOC emissions have been identified in foam mattresses that can be inhaled and absorbed into the body. Memory foam mattresses contain even more potentially harmful chemicals – to make the foam malleable. Think carefully before buying foam mattresses for your kids’ beds. Many kids (and adults) are sensitive to these chemicals and can end up getting very sick. If that happens, you’re stuck with an expensive mattress that you can’t return. 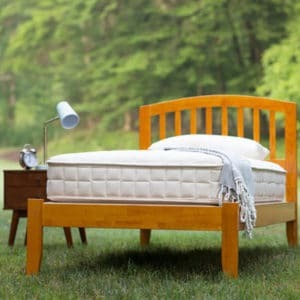 Since mattress manufacturers are required to meet government flammability regulations, they add fire retardant chemicals or barriers that can be toxic, including brominated, chlorinated, organohalogen flame retardants, antimony, modacrylic, polyacrylonitrile, boric acid and many other chemicals. PBDEs have recently been banned, but have been replaced with chemicals that can be just as toxic. 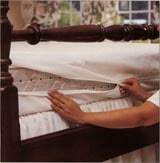 Some flame retardants are not heavily bound and can migrate from the mattress into the air and into household dust. They then become stored in our bodies and children are most at risk. Consumers are in the dark about what chemicals are used in the mattresses they are buying. Formulations are considered trade secrets and not disclosed. Even when the company says “no added flame retardants” it does not mean there are no flame retardants in the blocks of foam they purchased. Since polyurethane foam is highly flammable, chemicals are usually pre-mixed into the foam blocks sold to mattress manufacturers. Older Mattresses can be Toxic too! Since the chemicals never completely dissipate, older mattresses may continue to off gas even though they no longer contain the chemical smell. There is evidence that common bacteria and fungus in re-used, older mattresses can generate a higher concentration of toxic gases than new mattresses. Your kids don’t have to sleep on poison! Fortunately, mattresses made with natural organic materials are now available. Many of these mattresses meet or exceed flammability regulations with safe, non-toxic materials. Yes, an organic kids mattress is definitely important, but it’s even more important that ALL the materials used are non toxic and there are no harmful fire retardants or barriers. Cotton is firm and breathable. 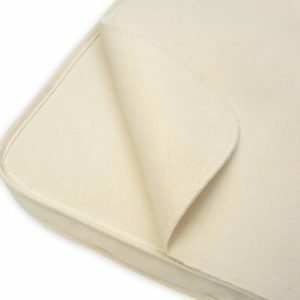 100% certified organic cotton is a perfect filling for a child’s mattress. It’s also the best covering or surface ticking material, especially when it’s quilted. Natural latex can also be a safe material, depending on how it’s made. Latex comes from the milky substance of the rubber tree plant. If you are going to use latex, make sure it’s all natural latex, preferably organic, and stay away from chemical/natural latex blends. If you can find GOLS certified organic latex, you know you are getting the purest natural latex available. Wool is also used in organic mattresses. Wool is a safe, non-toxic material when it’s organic or processed according to organic standards. Some mattresses are marketed as green, eco-friendly, or plant-based with descriptions such as Eco Foam, Bio Foam, or Soy Foam. Beware of these since the manufacturers replace only a very small percentage of the polyurethane foam with plant-based ingredients. For instance, soy foam is usually polyurethane foam with 10-20% soybean oil (GMO) mixed in. These mattresses are mostly polyurethane foam, which is highly flammable, so they also need fire retardant chemicals to comply with the flammability laws. Don’t be fooled by this green-washing. You’re still getting a load of toxic chemicals and off-gassing with many of these so-called eco mattresses. It’s important to check into all materials used, and it can be difficult to get full disclosure from the retailers or the manufacturer. Look for organic mattress and bedding companies who are GOTS certified. The Global Organic Textile Standards (GOTS) are the leading organic textile processing standards for mattresses. The standards require that fiber and fabrics used within a mattress, with limited exceptions, must be made from National Organic Program (NOP) certified materials and processed in accordance with the Global Organic Textile Standard (GOTS). All other components (such as innersprings, fire protection, etc.) must meet strict non-toxic standards. Always ask the manufacturer or retailer for complete details about what they use to pass fire standards. Retailers cannot legally sell mattresses without fire protection, unless you have a doctor’s prescription for a chemical-free mattress. There are safe alternatives to chemical fire retardants that will allow a mattress to pass flammability standards. Some manufacturers use wool since it has flame resistant properties. There are companies that use only pure wool for this purpose, but some companies use wool with chemical treatments added to boost the wool’s fire resistance. PLA fiber (made from plant starch) is flame resistant and a safe alternative. PLA fiber is non-toxic, hypoallergenic, and performs well in the wash. Make sure the PLA is free of GMOs. What does Healthy Child Recommend? Very informative post. Every parent must be aware of such information. Never knew, mattress could be so toxic. Really! !We should take care our children.Where they sleep,what kind of food they eat,what they use when they are playing,everything we should follow.There are many things which are harmful to them so parents must be conscious about mattress which can be toxic any time.Effective post Thanks, A Lot . I mean seriously? I don’t know about this.Thanks for sharing such an informative Article. Next time i will do what i learn from here. More careful about our mattress..!! Wow, great article that I’ll be sharing – thanks! I have noticed that certain baby mattress manufacturers advertise their products as “All Natural Soy” but I didn’t think they would dilute the soy with toxic materials! As the comment above said, all parents should know just how devious (and dangerous!) these companies are being. I came across your page while researching the best mattress for my little girl. I know a lot more about what to look for now, thanks. Wish I had known this years ago. I am replacing the beds in our household and have been researching non toxic mattresses for 6 months now. Dig deep and do your research!!! Many companies claiming to be safe are not. Also SPREAD THE WORD!!! Quite a few of the mattress stores that used to offer reputable, safe and organic mattresses quit carrying those products because they don’t sell. One business owner that used to sell Naturepedic said very few people even care about organic or request organic so he had to quit carrying the brand. WAKE UP AMERICA…..we are killing ourselves! No we cannot control everything but small changes can make a difference. People do not realize they are sleeping in a chemical cocktail. They are just not aware. Thank you so much for this article, we just threw my son’s mattress away after he wet it a couple of times, just to think about dust mites is scary and disgusting. I guess I’m gonna go with the Naturepedic organic cotton waterproof mattress pad with the new mattress we purchase thanks to this information.